Photos of the Past is a family enterprise based on photographs collected by Ron Blum over many decades. Members of the Blum family have been working in photograph re-production for over 100 years. They come from many sources – For example, old postcards, 3D stereo graphs, old photo albums, and original glass plate negatives. We are always interested in new acquisitions, so don’t hesitate to contact us if you have an interesting old photograph. Besides the collection, we have been involved in interesting projects over the years, drawing on the collection and Ron’s expertise in particular. Ron was taught photographic processing by his mother in 1950 and created a mini photo business offering film and print developing to work colleagues in 1952. This was at a hobby level that progressed to bigger thing in later years. He developed an interest in stereoscopic images and started collecting 3-D views as a hobby until it became almost an obsession! He amassed the largest collection of stereographs in the Southern Hemisphere. The driving force was the historic aspect of these images; it was like walking through a window into the past, such was the realism of 3-D. Over the years Ron has joined many national and international stereoscopic societies and written articles for their journals. Not content with twin images Ron started collecting glass and film negatives as well as photographic prints. Anything historic was his aim. Many authors and institutions have sought his photographic images for various projects. He took a particular interest in the Melbourne photographer George Rose who formed the Rose Stereograph Company in the 1880s and Ron has written two large books relating to the photographic work of George who took his 3-D camera around the world. One country visited was Korea in which he took some wonderful images. This fact came to the attention of the Australia-Korea Foundation (funded by Dept. Foreign Affairs & Trade) such that Ron was asked to go to Korea to assist with a photograph exhibition using Rose’s Korean images. This successful exhibition toured the country for two years culmination in a coffee table book of the Korean images and Ron was again invited to South Korea for the book launch. 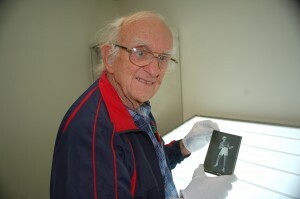 Ron has recently been involved with the South Australian Museum’s Polar Collection creating stereographs from over a 100 raw glass plate negatives taken on Shackleton’s 1907-09 Antarctic Expedition. Most of this collection has never been seen in 3-d before. As a historian Ron has written seven books mostly photograph related.